Providing the most visceral yet engaging sports car experience in the British luxury car maker’s current range, the new V12 Vantage S delivers exceptional sporting agility underpinned by admirable long distance refinement. Equipped with the new 573 PS Aston Martin AM28 6.0-litre V12 engine, featuring latest generation Bosch engine management, the car is capable of reaching 205 mph. Peak and low rev torque improves appreciably, too. 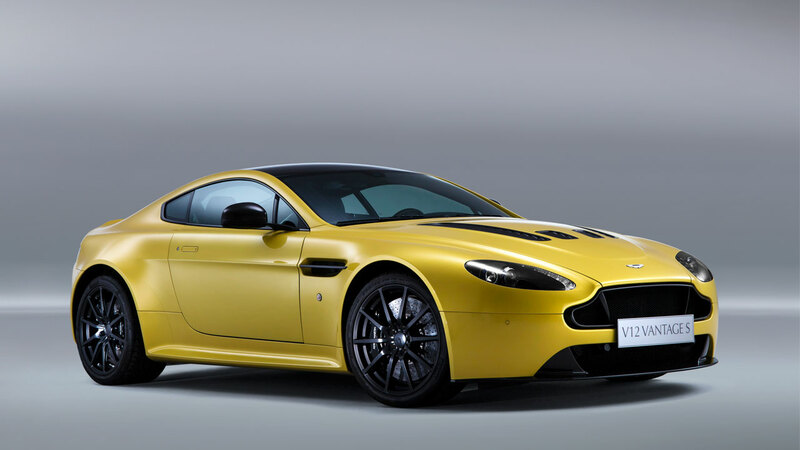 With 620 Nm available at 5,750 rpm – up from 570 Nm previously – the V12 Vantage S is not to be found wanting. Crucially, too, low rev torque – measured at just 1,000 rpm – leaps from 440 Nm to 510 Nm. This serves to both flatten and fatten the torque curve, thereby significantly improving driveability. 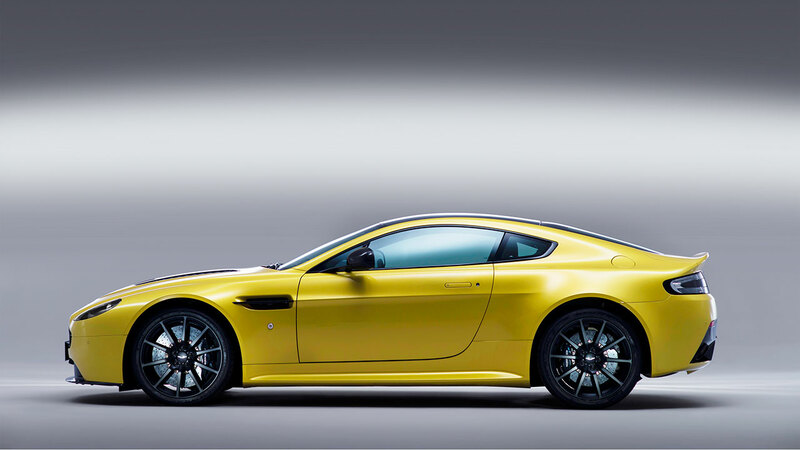 Aston Martin Chief Executive Officer Dr Ulrich Bez said: “The new V12 Vantage S is, simply, pure Aston Martin. It is extreme in its nature yet truly timeless in its design language. Another clear example is the new car’s new gearbox. The Sportshift™III AMT (automated manual transmission) is a major development of the automated manual gearbox that appears in the current V8 Vantage S.
Designed and engineered to exploit the full sporting potential of the V12 engine, the new Sportshift™III hydraulically-actuated automated manual transmission provides motorsport-style paddle shift changes for optimum performance delivery and efficiency. The unit is also appreciably lighter than the outgoing six-speed manual gearbox – saving 25 kg. The Sportshift™III transaxle, from transmission experts Oerlikon Graziano, joins an extensive array of new sport- and track-focused developments that ensure the V12 Vantage S is fully equipped to exploit the huge performance potential of its 6.0-litre naturally aspirated AM28 engine. The debut of three-stage adaptive damping – another ‘first’ for the Vantage family – allows the driver to more precisely tailor the car’s dynamic character. ‘Normal’, ‘Sport’ and ‘Track’ modes provide a broad swathe of dynamic performance that can be tuned to better suit the driver’s requirements. The system also governs the level of power steering assistance offered. Working alongside the extended adaptive damping system is a ‘Sport’ mode, controlled via a button on the centre console, that alters throttle response, gearshift speed and timing, and exhaust note to, once again, tune the character of the car to the driver’s requirements. A whole new exhaust system – derived from that of the One-77 hypercar, no less – is lighter, smaller and, crucially, even more sonorous than that of the outgoing car. The ZF Servotronic power assisted steering is new, too. With a quicker 15:1 ratio, it is linked to the adaptive damping button and offers two-mode steering assistance designed to best match the ‘Sport’ or ‘Normal’ settings generated by the Adaptive Damping System. 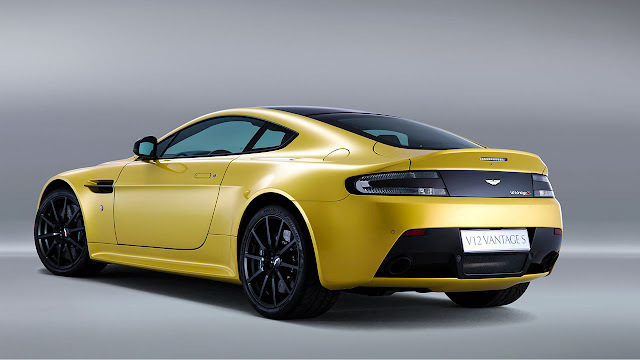 The V12 Vantage S has been restyled to reflect is position as the flagship of the new Vantage range. Most noticeable, perhaps, is the car’s grille that does away with the famous aluminium vanes – replacing them with a new carbon fibre arrangement that also includes sporty black carbon fibre or titanium silver mesh. Created to maximise airflow to the V12 engine, the new grille is inspired by that of the remarkable new CC100 Speedster Concept, nicknamed DBR100, which debuted at the 24 Hours of Nürburgring earlier this month and signals a new era of Aston Martin design language. Other clues that single out the car as new include the debut of new lightweight forged alloy ten-spoke wheels, and a subtle yet distinctive exterior graphics pack that includes black painted roof and part-painted boot panel. 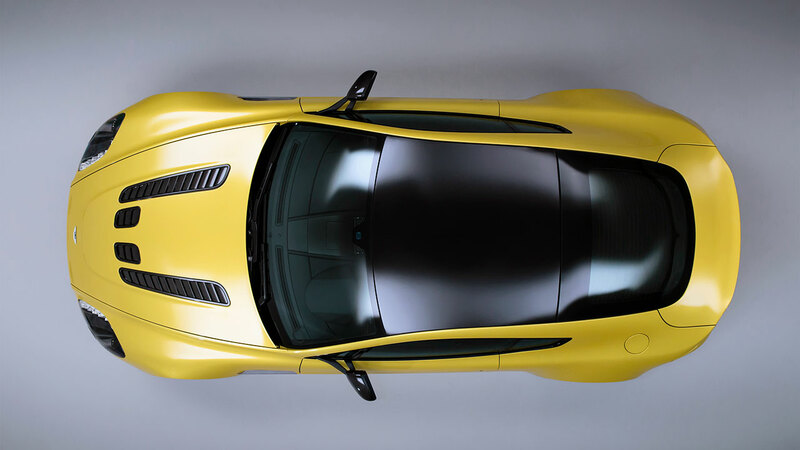 The new V12 Vantage S of course retains the same compact proportions and muscular stance as its predecessor, while features such as the pronounced bonnet vents and flared wheel arches underscore its sporting abilities. Inside, as out, the new car has been styled to reflect its powerful nature. New-style seating with Sport and carbon fibre Lightweight seat options, revised stitching and welt detailing, two leather grade options – Luxmill and semi-aniline – plus the possibility to include Alcantara, present V12 Vantage S buyers with an exciting array of trim choices. 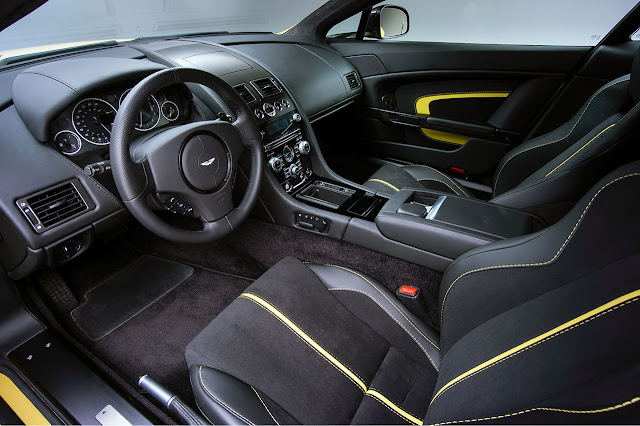 The optional Carbon Fibre Interior Pack, which adds the material to the car’s facia and door pulls, plus the availability for the first time in a V12 Vantage S of black pedals, further enhances personalisation options for those in search of a truly bespoke sports car.